If you have a DIY chalk paint question, you’ve come to the right place! I’ve been mixing my own custom chalky paints for 3+ years now. The Best Homemade Chalk Paint Recipes is definitely my most popular post! It ranks in the Top 3 on Google and has 1700+ comments…. and I have ALL OF YOU to thank for this! The interaction on this HMCP post has been nothing short of amazing. You all ask the BEST questions and have generously chimed in with your experiences – good and bad. The bulk of all the Q&A’s can be applied to brand name and diy chalk style paints . I realize not everyone has the time to scroll through 1700+ comments so I’ve put together this list. 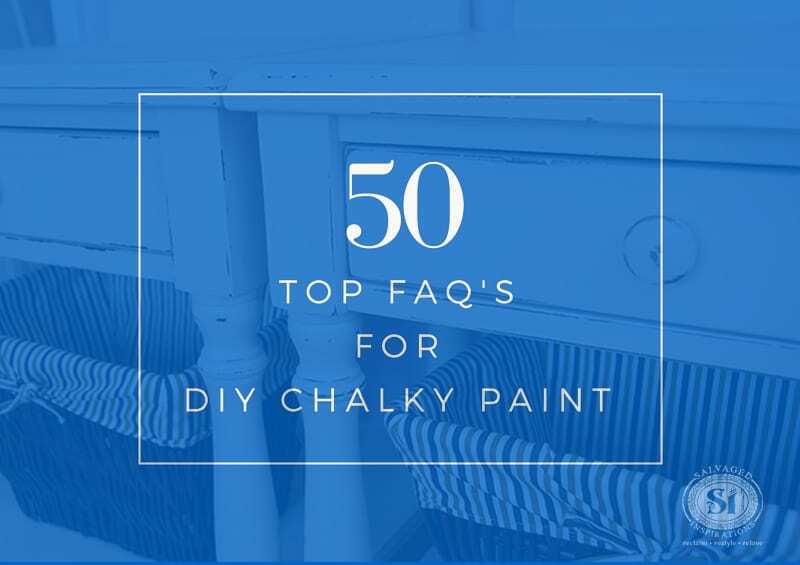 Here are the Top 50 most frequently asked questions (FAQ) for DIY Chalky Paints! This post contains affiliate links to products I use. Should I clean my furniture first? Yes. If your furniture/project is dirty, stained or greasy, a cleaning using warm water, vinegar and water, or TSP is recommended. Do I need to sand prior to using a DIY chalk paint? NO. However, whether you use a DIY or brand name chalk paint, a light sanding for shiny/glossy surfaces is recommended. Do I need to prime before painting? No. The only time primer is beneficial when using DIY or brand name chalky paint is when bleed through occurs. This may happen if the wood’s natural tannin starts showing through a light colored paint. Can DIY chalk paint be used over a piece that’s already painted? What paint sheen works best for these recipes? Flat, Matte, and Eggshell paints will give the most authentic chalky results. Can any water based paint be used? Yes. The above recipes work with water based paints. eg: latex, acrylic, crafts paints, emulsion (in the UK). Can any color be used for these recipes? Can I use acrylic paint with the above recipes? Yes. ANY water based paint will work. Can I use paint+primer all-in-one for these recipes? Yes. I have used paint and primer all-in-one for these recipes and it works. However, it’s not my first choice because it sometimes thickens a little more than a regular latex after the chalking ingredient is added. Is latex paint the same as emulsion paint? Will the chalking ingredients change the color of my paint? My plaster of paris is clumping together in the paint. What did I do wrong? It may be the P.O.P was not properly mixed into the paint OR the length of time it has been sitting/stored. I would try adding a little less plaster of paris and/or using a little water to thin out the clumps prior to painting. I want to use a really dark paint. Will the Plaster of Paris lighten it? No. None of the chalky ingredients will lighten your dark paint but keep in mind if it’s not 100% mixed in, you may see the tiny granulates of the chalking ingredient once you sand. It’s extra important to mix thoroughly when using darker paints! Do paint samples work with these DIY recipes? Yes. 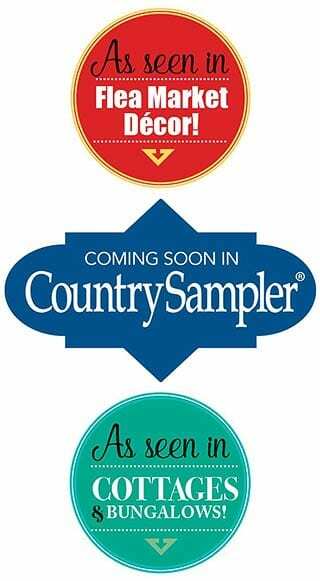 So long as the samples are water based. Other DIY recipes use less chalking ingredients. Is this okay? Yes. I prefer the above recipe guide because it gives an authentic brand name chalk paint finish. You can add less. It’s like baking a cake – feel free to experiment and adjust to find YOUR preference. Why don’t you add water to you Calcium Carbonate recipe? No water is required if a good quality CC is used. My favorite brand of CC is the NOW Foods Calcium Carbonate. It is extra powdery-fine. Mixes into the paint beautifully. And provides an amazing chalky finish! What do you use to mix your DIY recipes? Why is my paint still gritty after I’ve mixed it really well? It may be that the brand and/or quality of chalking ingredient isn’t fine enough. Or maybe it did not completely dissolve when mixed with water. I find using warm water is helpful and using an inexpensive blender to thoroughly mix all the ingredients is key. What brand of Plaster of Paris do you use? My go-to brand is Dap Plaster of Paris . What kind of grout do you use? What brand do you use for the Calcium Carbonate recipe? My favorite brand of CC is the NOW Foods Calcium Carbonate. It’s super fine, mixes into paint perfectly, and provides the best chalky finish! Do I need an expensive or special brush to apply the paint? No. Use any brush you like. I’ve used cheap dollar store brushes and brand name Purdy’s with these DIY recipes. Both gave me great results. How can I get rid of bleed through or blotchy spots? Primer or shellac will stop bleed through. What should I do if my paint mixture starts to thicken up? Add water. Adding a small amount of water to thin your paint will work nicely. Can I use a paint gun to spray DIY chalk paint? Yes. I’ve sprayed DIY and brand name chalk paints through my spray gun and both gave a flawless finish. Can I use a roller to apply DIY chalk paint? Yes. A high density foam roller is preferred over a textured roller. For best results, apply a few thin coats rather than one thick coat. How many coats are required for full coverage? For full coverage and a professional finish, 2-3 coats is usually required whether using DIY or brand name chalk paints. Can I use an extender like Floetrol in these DIY Recipes? Yes. Floetrol and/or thinning paint with water will also extend painting time. Why am I getting a lot of brush strokes? If you’re getting a lot of steaks/brush strokes, it could be as simple as your paint needs thinning down with a little bit of water so it’s not as thick. Better results will be achieved with a few thin coats rather than one thick coat. Can I create a wash from my DIY chalk paints? Why am I getting tiny white specks in my paint after I sand? This occurs when the chalking ingredient is not 100% mixed into the paint. When working with Calcium Carbonate, always use the finest grade possible. My favorite is the NOW Brand and I’ve never had any issues. With the other chalking ingredients, mix thoroughly with a little warm water prior to adding it to your paint. Do I need to sand in between each coat or on the final coat? To get a smooth professional finish, I sand all my pieces with a fine grit sanding pad between coats and after painting. It’s up to you though. Some people prefer more texture. It just depends on the look you like. When should I use poly to seal chalk paint? “Poly” works well for high traffic furniture eg, kitchen table/chairs etc. It’s a very durable topcoat and comes in oil or water based. Polys provide a hard durable topcoat with the added benefit of easy cleaning. Do I need an expensive or special brush to apply the wax? No. Fancy wax brushes are not needed. For many years I used an old rag or cheap chip brush. Both gave me great results. Will polyurethane or polycrylic yellow my paint job? Possibly yes. If you use an oil based or water based poly on a white or light painted piece of furniture, it will most likely slightly yellow the finish over time. When I’m using white or light paints, the water based poly I use is Varathane Diamond Poly Non-Yellowing. What type of wax is best to seal HMCP? Any brand of wax works nicely but some are easier to apply than others. Some of the brands I’ve used are Annie Sloan’s Wax, CeCe Caldwell’s Wax and 100% Bee’s Wax. Other excellent and cost efficient alternatives are Trewax and Minwax . And here’s a great tip to turn these “harder” waxes into buttery soft ’boutique’ waxes! How long should I wait before applying wax? I like to wait 24hrs when/if possible, but so long as the paint is 100% dry, you can wax. Wax vs Poly – which should I use? I usually wax, but I like to use Poly for high traffic items. Here’s how I decide on which topcoat to use. Does a waxed finish need reapplying down the road? Yes. Once a wax finish has been wiped down numerous times and/or starts to lose it’s luster (this may take a year or two for you to see any difference) reapplying another coat of wax is very beneficial. Can I use homemade chalk paint on my walls? Yes. However ANY type of chalk style paint is VERY porous and easily picks up dirt, oils etc. So maybe not ideal for high traffic areas. Can I use these chalky paints on melamine? Yes. I would sand first. Having said this, a wiser choice may be a special “melamine paint” for durability and longevity. Melamine paints are thicker and stickier than other paints and specifically made to adhere to slick melamine and plastic surfaces. Can I paint indoor brick? Can I glaze over a chalky finish? Can I use DIY Chalk Paint for outdoor furniture/projects? Yes. I’ve painted outdoor furniture and then used a top coat with an outdoor sealer to protect my work. Can I use exterior paint with these recipes? Yes. If you have any leftover exterior paint it will work but the end result may not look as “chalky”. 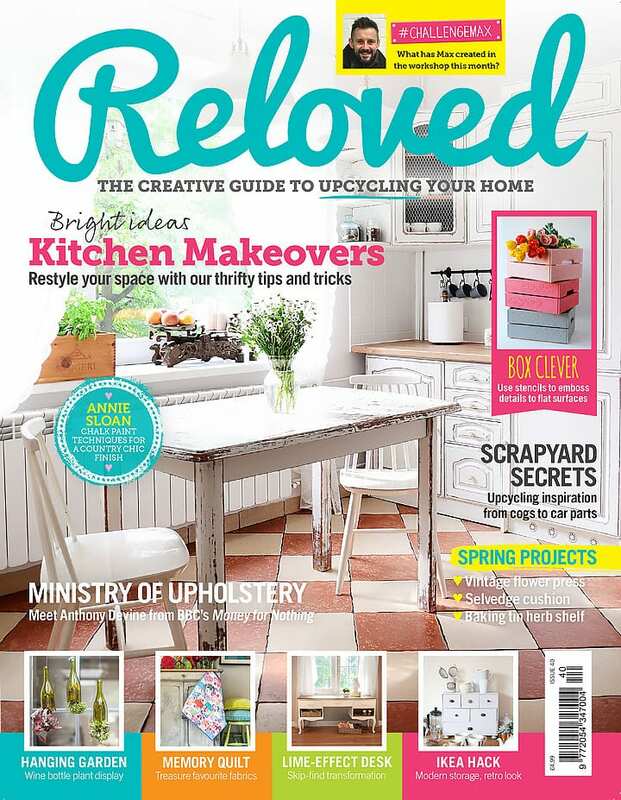 If you’re after an authentic chalky-matte-look, a water based eggshell or flat interior paint is ideal. How do you get the different colors of DIY chalky paints? You buy a water based paint (already tinted) in ANY color you wish, and then add the chalking ingredient of your choice. Water based paints in flat or eggshell sheen will work best. Can I write on these DIY versions like a real chalkboard? Yes. Depending on the paint color you use, it may not be as pronounced as a traditional blackboard. Also, seasoning your chalkboard prior to use is advised to prevent ghosting. Does DIY Chalk Paint work on fabric? Yes. 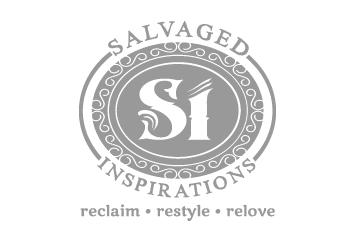 I’ve only tried using a General Finishes Chalky Paint on fabric, but some of my SI Readers have tried the DIY version and reported back with good results. Will DIY chalk style paints work on glass, plastic or metal? Yes. However, like brand name chalk style paints, the DIY recipes will benefit from a light sanding if it’s a shiny surface. Are these recipes safe to use? Safety precautions should always be taken! Even when working with ‘safe & natural’ ingredients or paints, ALWAYS wear a mask and work in a well ventilated area. Inhaling any sort of dust is not good, so work safely! WOW – CONGRATS – You’ve made it to the end – all 50 of them! 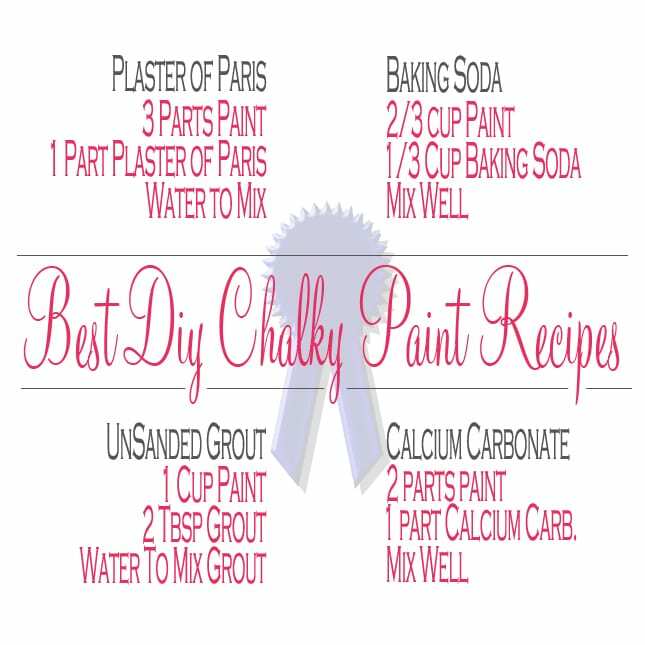 Here’s a FREE Download Best Homemade Chalky Paint Recipe Card! And if you’re still thirsty for information and want MORE excellent DIY Chalky tips, comparisons and conversations, you can find them here! The opinions and techniques in this FAQ post are my own and reflect what has worked for me. I always like to learn new things… so if you have any suggestions, questions or add-ons – I’d love to hear from you! All you talk about is painti g FURNITURE, What happened to the instructions for painting glass bottles. Your are very generous to share all this knowledge! I’m getting ready to redo a large old oak hutch (my husband is skeptica). that we bought at a thrift store 8 years ago. I’m doing a medium shade of moss green mixed at Home Depot from a sample chip. I’m not so nervous after reading all your tips. Thanks so much. Thank you for sharing all this great information. I was curious what type of paint sprayer you recommend. Thanks! Hi Ashley! I use this paint sprayer here. Thanks so much for sharing this incredible amount of information. I subscribed to received your newsletter, and can’t hardly wait to read more … again, thank you for your generosity of spirit. I’m so glad I stumbled upon this site! Wonderful information for this “newbie” chalk painter… Thank you for taking the time to make this FAQ list! Lisa, paint (chalky or any other type of paint) will not fill in the grooves of honey oak cabinets… maybe slightly but not enough to give a smooth finished look. The wood grain texture will still be visible. “The Top 50 FAQ ~ DIY Chalk Paints” is an insightful and useful post for chalk paint lovers. Almost all FAQs covered here which could arise in our mind while chalk painting. Great article! I will be referring back to it often. Where can I buy chalk in the Pilar area? Wonderful concise list. Thanks for centralizing all this info. Very informative & handy guide. This is why we love your blog! Love this condensed list! Friends ask me all the time how I make my chalk paint so I will be sure to send them here. Thank you! Wow…thanks for all the incredible info. I never knew I could use DIY chalky paints for so many different projects. Thanks for all your amazing tips Denise!!! Pleasure Monique! 🙂 It’s amazing what chalk style paints can do…brand name and DIY versions!